I followed my own thoughts re the pears. White wine, water, sugar. Few cloves, couple bits star anise, lemon zest. Plenty saffron. Tasted. . .weird but nice. Too much saffron, I think, and all water no wine might be better. A chicken stock is slowly coming into being on the stove: Sunday will be a nice 3 course meal of chicken soup, ravioli with spinach and ricotta then veal, either as a schnitzel or saltimbocca followed by pannacotta and a puree of raspberries. Tomorrow, chicken schnitzel and beurre bosc pears poached whole in a sugar syrup with spices including saffron and dry white wine. mantra wrote: I was just beginning to like their honesty and was hoping they would stay around for a while. there is a difference between being honest, and being deliberately rude. They were after the shock value, not honesty. I enjoy both shows - but MKR is my favourite. That's disappointing news about Josh and Austin. I was just beginning to like their honesty and was hoping they would stay around for a while. Iggy and Romel are annoying. I think that Josh was right when he said he bet they both did a Masterchef class before they had to cook. I can't imagine MKR actually allowing them to progress too far. The viewers would be annoyed at the unfairness of having professionals pitted against amateurs. yes I'm afraid I'll watch it. I had to go and get suckered in to watching MKR !! But I read, Josh and his brother, are not real cooks, they were spotted by the MKR people, on some media, and asked Josh to join MKR, and Josh asked his brother, who has never cooked anything in his life. Well, the crap they put on everyone, now, Sunday, they are the cooks, and looks like they quit or something. Should be interesting....stay tuned for Sunday MKR!!! Sorry guys but the best cooking show on TV, bar none is Maeve O'meara Food Safari on SBS. She's a lovely lady and develops a wonderful rapport with every day people from every corner of the globe who've chosen to live in Australia. She goes into their home, gets their back story then mucks in to help them cook a family feast or one of their favourite 'come home to mamma' comfort foods. And of course she visits restaurants to see professionals at work so you get a bit of the flash chef routines, and every day home stuff as well. I prefer MasterChef. I don’t copy the recipes, just like to see people cooking with some passion! well.. I'm a bit of an MKR junkie myself. I've learned quite a lot over the last few yrs, techniques and such... but I also enjoy watching the people. Always a fave of mine... watching people. whatever.. having spent many years in catering, I find it highly amusing. I've been addicted to watching MKR (My Kitchen Rules), and amazing how a lot of recipes that most have always made, seem to stuff up on the night. Is it all the cameras in their faces that make them nervous or something? So having known this all my life, I used to do antics to make my young piano students so they would be fail safe. Pretending there are crowds of people in the room, and some would giggle, some would get up and walk somewhere, some would talk, some would just stare, etc. And I would literally do cartwheels to make them distract proof! Yes, all that acting worked, they were crowd proofed!!! And perfomed beautifully and happily. And I would literally do cartwheels to make them distract proof! :giggle Yes, all that acting worked, they were crowd proofed!!! And perfomed beautifully and happily. Junket, hmmm, my sis made junket a couple times, not that exciting and never made it again or even thought about it. Damn, can’t think of the name now but a dish of milk and wine was a test how good a young woman’s cooking was. 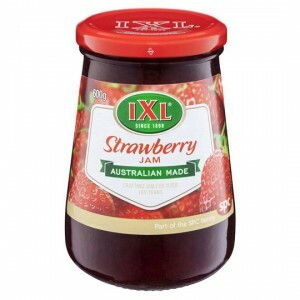 A jam is a conserve or a preserve I suppose? Can have fruit jellies—pectin the setting agent. Red currant jelly the most well known I guess. Jelly—set by gelatine. Use leaf gelatine, not the powdered gunk. Texan wrote: Roast beef, stewed in water and cream of mushroom soup with onions, potatoes, and carrots, poured into a bowl and flavored with pepper, salsa, and cheddar cheese. Dinner. The salsa is a little unusual, though. Not that popular here in Australia, except as a dip for corn chips. When I make breakfast, I fry the bacon first and poor off the bacon grease, but use the seasoned pan to scramble my eggs. Add biscuits and gravy or jelly with orange juice and you have a good breakfast. Our biscuits are kind of like your scones. Your biscuits are our "cookies". Another word difference came up there - jelly. 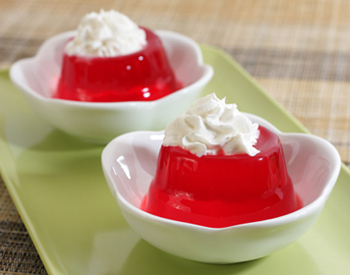 Here in Australia, jelly is a desert (which we often have with ice-cream). What you call jelly, we call jam. So, what do you call what we call jelly? So, what do you call what we call jelly? :? The salsa and grated cheddar was my idea. The lovely Mrs Texan didn't include that. I flavor many things with salsa at times. Sometimes, I put it in scrambled eggs, black eyed peas, green beans, and on reheated steak leftovers to give it a little moisture and zest. I won't ruin a hot steak off of the grill. I also dip grilled cheese sandwiches in salsa. These aren't normal mainstays of even the Texas public. It's just one of my little salsa quirks. I usually use the extra chunky salsa for adding to foods so that the salsa doesn't just overwhelm the taste of the food, except on reheated steaks. Microwaved steak leftovers need a little extra help. Roast beef, stewed in water and cream of mushroom soup with onions, potatoes, and carrots, poured into a bowl and flavored with pepper, salsa, and cheddar cheese. Dinner. Fried peaches for breakfast. Yum. I actually consider recipes as guides only, and sometime tyrants. I've actually tried a few actual 'recipes'.... and end up with so much washing up, it's a real pain in the ………. Besides... I only have to please myself. Heh, still buying cheap cookbooks and some not quite so cheap. Spent some time in op shops today, got some cooking and gardening books, 50¢ to $2.00, good value. Also 2 Earth Garden magazines with 3 articles on gardening in clay. These mags were free: I will write down any info and pass them on to another op shop. Today I received through the post a really nice book: “A bowful of broth” by Miranda Ballard. Also received “Johannes Kepler and the new astronomy” which should be interesting. Kepler had a medieval mind yet his astronomy, reformulated by Newton is very modern, dispensing with the whole geocentric astronomy and it s fiddly rubbish to try to make it work. These are very ripe, can get better eating mangoes (reflected in the price, $1.50 each. Will eat this in winter, bit of summer on my plate.